Off-road vehicles... ATVs (all-terrain-vehicles) or 4-wheelers- beloved today by off-road vehicle enthusiasts and popular as versatile and hard-working tools by ranchers and farmers. 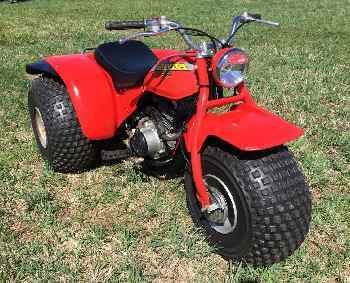 The first ATVs began as 3-wheelers in the 1960s. Honda was the most popular brand and made 3-wheelers a household name. In 1970, Honda introduced their ATC90 (All Terrain Cycle). It was designed to be totally recreational and had large balloon tires instead of a suspension. They were fun, popular with young riders, and set the industry on fire. It was also during the 70s that farmers realized how useful ATVs were for getting around working farms and ranches, often with rough terrain not easily navigated by pickup trucks. This really opened the market up to a whole new segment of consumers. Honda produced several new models, with full suspension and a five-speed transmission. 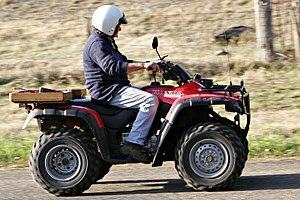 Some off road vehicles were designed for farm work, others for recreation or even performance or racing competition. Despite the enormous popularity of the "3-wheelers", during the late 70s it started to become apparent that there was something inherently unsafe about the design. More and more casualties in the ER, mainly due to the vehicle flipping or turning over. Tragically, along with many adults, lots of children were seriously injured or killed while riding on 3-wheelers. Although the ATV manufacturers had started to embrace the new 4-wheel concept (which proved to be a much more stable design), production of the 3-wheeler did not came to an end until 1987, when they were officially banned. The very first 4-wheeler, the QuadRunner LT125, was manufactured by Suzuki in 1982. Honda introduced its first 4-wheeler in 1984, the TRX200, and Honda was by far the most popular brand of ATV that decade. Yamaha joined the off road vehicles fray with it's YFM200 in 1984, and Polaris introduced the Trailboss in 1985, both 4-wheelers. Kawasaki's first four-wheeler, the Bayou 185, came out in 1985, and their first 4-wheel drive ATV, the Bayou 300 4x4, debuted in 1989. By the 1990s, it seemed every farm had a working off road vehicle or ATV, with Honda still leading the pack. 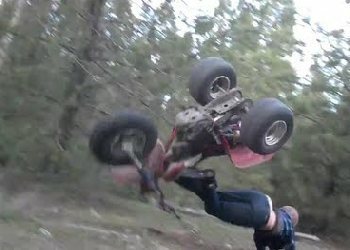 And sport and recreational ATVs have been gaining in popularity ever since. But now... it's on to side-by-sides! The side-by-side (often written as SxS) is a small 2- to 6-person four-wheel-drive off-road vehicle, also called a UTV (Utility Vehicle). 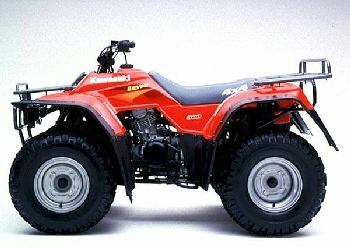 The main difference between a SxS and an ATV is that the seating is "non-straddle" and arranged so that riders sit side-by side. It is operated similar to a car, with a steering wheel, gas and brake pedals. The larger SxS vehicles usually have seat belts and roll-over protection, and most have a rear cargo box. SxSs are capable of carrying a much heavier load and can truly be utility "workhorses". But they are also hugely popular for recreational off-road adventure. As ATVs became more popular and affordable in the 1980s, the industry also began working on a different design, the UTV, or 4-wheeled lightweight side-by-side utility vehicle, capable of use in rough terrain. 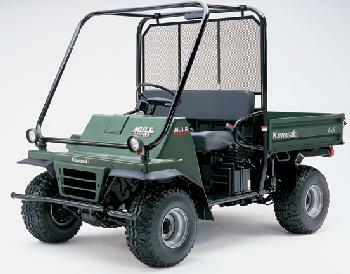 The first one was the Kawasaki MULE (Multi-Use Light Equipment). Although the UTV was meant to be mainly utilitarian, it also caught on with recreational off-roaders, and has become more and more popular into the 21st century. Today dozens of manufacturers produce SxSs for both utility and recreational use. What is the best SxS on the market? We have one and consider it probably our most-loved (definitely most-used) toy.... Click to find out what that is.